Who is Janet and what is a “fosse”? I found this lovely print in a local charity shop. 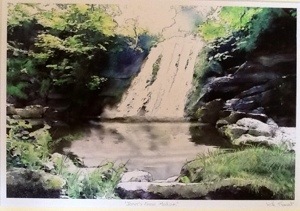 It is not numbered but it is signed and called “Janet’s Fosse, Malham”. 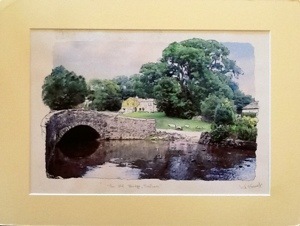 Sadly the signature is almost illegible but it looks like K A Forest. Whoever he or she may be I think it is a skilfully drawn and coloured work of art. Probably pen and ink but judge for yourself. It came unframed and cost me £3. It definitely needs a good home! 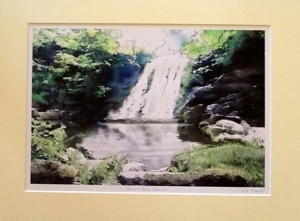 As to my original question, Janet was said to be a fairy queen living in the cave behind this waterfall which is situated near Malham in the Yorkshire Dales. A “foss” is the Nordic word for waterfall and this, presumably, is where the word “fosse” comes from.